WOW! 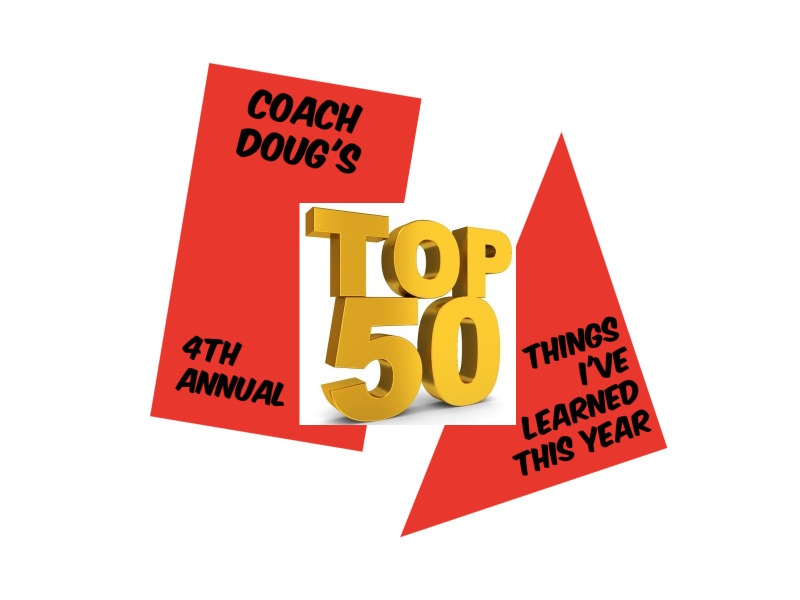 Another year almost done and this now is my 4th annual list of ALL the amazing things I continue to learn year after year! Some are hold overs as they continue to educate me and I just know they are list makers every year! There are of course some new surprises and I hope this makes you sit down and see WHAT DID YOU LEARN THIS YEAR! I wish you all a wonderful 2019 and hope that you can find inspiration, laughter, lessons and joy in this list, as I do each and every year I write it! You need a plan, or you’re toast. Putts down grain are WAY faster than you think they are! Faith is a very good thing to have in your life. Never Ever Give Up. You Need To Keep Moving Forward! You need close friends that you can rely on. Hearing your name called 2,543 times in 5 days is both annoying and rewarding at the same time! It’s ALWAYS about them, not you! No matter what others shoot, stick to your game plan and remember it’s YOUR GAME YOUR WAY! If you coach Juniors you need to have good relationships with their parents. In order to connect to a junior you need to remove your Golf Pro hat and put their’s on. You can practice, prepare and be ready for your round BUT you cannot control the weather, course conditions or what other players shoot. Open Championship winner Ben Curtis gets it and is giving back to the game that got him to the pinnacle. Kent State University is a REALLY cool place to visit. Admitting you were wrong or made a mistake is always the right choice. Being on a Podcast is both an honour and REALLY cool! I have a LOT of things that I think about….seriously I do! 1 inch can have a profound effect on winning or losing. U.S. Kids Golf could be THE MOST important golf company in the world if we want this game to continue to grow and thrive. Coaches need to SHARE their stuff more often and be less insecure. Cupcakes are an acceptable choice to have when celebrating. Being a Jr Golf Coach is Life Changing – Go Try it for yourself! NEVER underestimate the strength of an 11 yr old girl in an arm wrestle. Playing a round of golf without having to rush, hurry or worry about being somewhere doesn’t happen often enough. Surrounding yourself with a great team is a necessary part of being successful. Rain Delays can ruin momentum. There are 2 ladies in Arizona who I would consider Golf Whisperers. Setting a clear intention for your shot gets you closer to your goal. Hot Yoga is like Oil for the Tin Man. Hot Wheels cars and track are an essential coaching training aid! My 2 kids are just AMAZING and make me laugh all the time. Having experts you can consult with and bring players to is a privilege. Whatever it is, IT has to SERVE you or you shouldn’t be doing it. You definitely WAIT for the backup to finish before wiping your iPhone. Top Golf is really cool and has the opportunity to make a HUGE impact on Golf. Your influence as a professional can have far reaching effects that you never see. 80 lbs of Dynamite never ceases to surprise me. Younger brothers of older brothers watch and learn to avoid all the mistakes their older ones make. Take the time to call someone and just LISTEN. I need to write things down ….SQUIRREL! Don’t be afraid to be truthful & honest. I have some AMAZING friends in all parts of the WORLD because of coaching golf. Turning 50 this year didn’t phase me as I thought it might. Worry LESS about the things you CANNOT control. Coaching kids leaves their laughter on your soul. Thank you so much for allowing me to share some of the amazing things I’ve been able to experience and learn in 2018. I am super pumped for 2019 and I encourage all of you to set your sights as high as you can.